« Deja Vuesday: Do your shoes smell? Love those Facebook Fans? Well, you have to love them BACK. Every consignment, resale, and thrift shop in the country seems to value their fans of their Facebook business page highly. They rejoice that, with little effort and seldom an expense, they can reach so many people so often. How simple is a post like this… and how motivating is it? All a fan has to do is tell the cashier “this Tuesday”… and get a deal! 1. It’s posted at the busiest time of day, for the next day’s use. That way, on Monday evening Fannie can get the code and use it first thing, or any time the next day. Posting on the same day as the offer’s good would risk alienating the folks who didn’t see it until half the business day was past. 2. 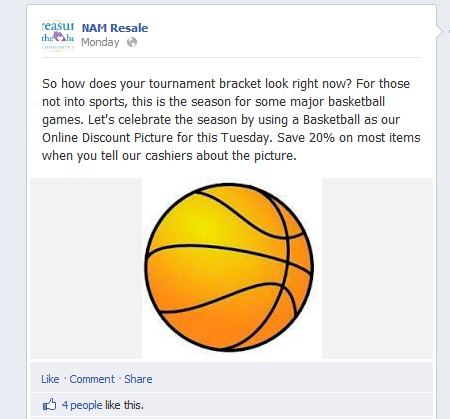 You want your fans to remember it, so use a graphic… the basketball in this case… and not just a word. Most people remember visually rather than audibly, so find a source of free graphics, bookmark it, and use them! 3. You want your fans to remember, all day, the offer, so use a graphic that relates to whatever might be crossing their minds anyway. Here, basketball games. Other times, an Easter egg, an umbrella on a rainy day, a horse for the rodeo that’s coming to town. An image, in other words, that will flit across their minds thanks to some other advertising, and remind them of your shop. 4. You want them to “share” the discount, so be sure to include who/what/where in the text every time. When their friend sees the share, all the info must be right there… NEVER count on a viewer to actually click on a link to find out the details. Trust me, less than 20% do. Become a NAM fan here. They do good work. Full disclosure: they were a consultation client of mine.